I have had a profusion of basil, so I am making the obvious thing with it: pesto. There was a time when everything was pesto. Pesto this, pesto that. Some good, mostly not so good. With time a lot of the commercial versions got cheap and took shortcuts. Specifically they no longer used virgin olive oil, or even olive oil at all. It reminds me a bit of one of a classic Seinfeld episode, The Busboy. GEORGE: Why do I get pesto? Why do I think I’ll like it? I keep trying to like it, like I have to like it. JERRY: Who said you have to like it? GEORGE: Everybody likes pesto. You walk into a restaurant, that’s all you hear – pesto, pesto, pesto. JERRY: I don’t like pesto. GEORGE: Where was pesto 10 years ago? Of course Jerry ends up eating pesto! For a while I was a bit over pesto as well. It was just done to death. But then I had masses of basil to use up. Masses and masses of it. And I rediscovered pesto. Now I am addicted. In mid-winter, I purchased a pot of live basil from ALDI. 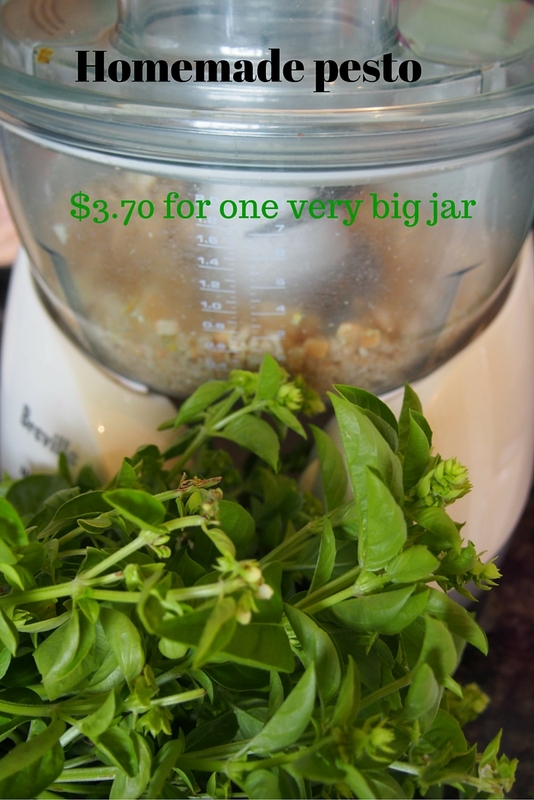 I needed some basil for a recipe I was working on and this was the best value option. It was on special – only $1.99 – I think because it was the last one. These basil pots are basically mass plantings; heaps of seedlings crammed in. I nursed it on my windowsill in the kitchen, remembering (just) to water it and kept it inside away from frosts. Then in spring I planted it into an old wheelbarrow my Dad helped me convert into a vegetable patch; he was inspired by something similar at Floriade. My wheelbarrow full of basil – the weed like thing in there is an iceberg lettuce gone to seed. There is a bit of silverbeet in there as well. By the time I planted it out, the seedlings were all puny and not especially healthy. Their roots had been restricted and they hadn’t had as much sunlight. There would have been around 20 seedlings in there. I planted some in the wheelbarrow, and some in the other vegie patch, and others in the planter box. A few I gave away at a Buy Nothing Project giveaway meet. I was so surprised when the ones in the wheelbarrow took off. Actually they rocketed off – they really just grew. I have never had much success growing basil but this year it must have been in the right place at the right time. I couldn’t give it away fast enough. And it made fantastic pesto. Little A loves pesto. We call it ‘green goblin sauce’. I am not sure why. It is kind of a joke that just stuck. A large jar of pesto – this is around twice the size of those tiny jars you buy in the shops. And still there was more. This recipe makes a large batch, around one decent sized jar plus a bit. I use it on pasta, in soups – just about everything. Save around half of this recipe to use for another recipe I have coming up. I made it cheaper by substituting the more traditional pine nuts for cashews. I had noticed that a lot of commercially available pesto sauces are using cashews instead. I did not, however, skimp on good quality olive oil. Pesto is really carried on the quality of the oil. If money is really tight you could substitute a good quality vegetable oil, or do half half with the olive oil. The health benefits of eating olive oil, however, make it worth spending a little extra to ensure your well-being. In a heavy cast iron frypan, dry fry the cashews until they are toasted. (Alternatively bake in a low temperature oven). Set aside to cool. Place the cashews in a food processor and blend for a minute or so. Add the cheese and continue to pulse. Then add the basil leaves (strip them off the stems), and whiz in the food processor – while gradually pouring in the oil. I am always surprised by how long the pesto takes to combine in the food processor; it is best not to hurry this process. Once ready, spoon into a steralised jar and keep in the fridge. I find it lasts a week and a bit more (although it is yummy so I haven’t tested its full preservative potential). Cashews are an interesting ingredient. I’ve always used pinenuts. I’ll have to try your version now. I thought I had an aversion to pesto until I started making it with my fresh basil. There’s something about the aroma of it that makes you salivate immediately. It’s so good. Pinenuts are amazing but unfortunately a little bit expensive here. Cashews are cheaper, I think because a lot are grown in Vietnam and other places in Southeast Asia. I guess any good quality nuts would do. Locally grown nuts in autumn would be ideal. I love making pesto! And we are about to move, so I really can’t have a garden right now, but I love the idea of live herbs. I’m sure that my hubby would love me to have them too, so we don’t have to spend so much on them in the future! I love your blogs, too! You could perhaps try potted plants on a balcony or windowsill? When you have spare time from managing all of your various roles! Yum – I love pesto! Even better when it’s homemade! Definitely even better when homemade! Beautiful!!! We have 3 large pots loaded with basil that desperately needs to be picked and used, will be making me pesto for sure. Do you think it would freeze? I’m sure it would freeze well because of all the olive oil. I think basil generally goes black when frozen, but the olive oil will save it. But to be honest my pesto never lasts in the fridge that long – it disappears fairly quickly. It lasts for a while in the fridge as well as the olive oil acts as a preservative. I think we all went through a pesto this, pesto that phase. Then suddenly it was over, yet good pesto remains really, really good. I like to make a batch of ginger and shallot sauce (chinese pesto) and store it in the fridge and use it on everything!!! I love pesto, but have never tried making it myself! I bet it tastes way better than store bought! It takes longer than you might think to pick off all the leaves to make the pesto, but the effort is well worth it I think. I agree about the home made versions being so much better than the shop ones. Love those Aldi herbs in a pot! We usually use macadamia nuts, I haven’t tried cashews, and I also haven’t tried them roasted first – sound like good ideas. Also a good idea to harvest the basil now before it all shrivels as the soon as the weather turns and surprises us. Oh, macadamia nut pesto would be amazing! I still love pinenuts with pesto, but it is just that little bit more expensive. And yes, I am on a mission to use up all my basil before the fronts set in. this is the best way to keep your basil going long after the plant dies back! Most definitely it is! As fivebeansfood notes, it is a bit of a rush now to harvest before the first front (traditionally around about ANZAC Day).